College of Sciences student Paola Rivera takes full advantage of the extraordinary experiences offered by NC State that will better prepare her for a career as a health professional. Photo by Becky Kirkland. NC State student Paola Rivera grew up as the daughter of a veterinarian, and she recalls people assuming that vets make a lot of money. In reality, her mother was a single parent who also worked two other jobs. What’s more, when Hurricane Maria hit Puerto Rico in 2017, Rivera’s grandparents came from the island to live with her family, stretching finances even thinner. When she applied to college, the high school valedictorian from Salisbury received a number of acceptance letters but had concerns about paying out of pocket and through loans for many of those opportunities. The receipt of the Benjamin Hill Price Scholarship and Barr Systems Inc. Dean’s Scholarship from NC State took away a lot of that stress. Now a sophomore majoring in biological sciences with a concentration in human biology and minors in genetics and psychology, Rivera has plans to go into the medical field and eventually focus on pediatrics. She didn’t make a final decision to attend NC State, however, until she toured. The campus and its eco-friendly nature very much appealed to her as she observed composting and recycling going on in the classroom buildings and residence halls, and she noted Talley Student Center is ranked among the most renewable energy-friendly buildings in North Carolina. Rivera said that, being of Puerto Rican heritage, she also noticed the diversity on campus. “People from other areas might not notice it, but I enjoy the diversity NC State has to offer,” she said. “It’s nice seeing people from various backgrounds, ethnicities and races all striving for the same thing: a quality education. Another factor in Rivera’s decision to attend NC State was the opportunity to join a Living and Learning Village. She first lived in the Students Advocating for Youth (SAY) Village, where she had the chance to serve as a mentor helping an elementary-aged boy improve his academic skills and his confidence. The pair worked on specific academic skills such as vocabulary, did science experiments and cooking projects, and talked about handling emotions – discussing how the younger student could express his feelings in different situations. This year, Rivera’s part of the Arts Village, uniting students from various personal and academic backgrounds who share a passion for the arts. 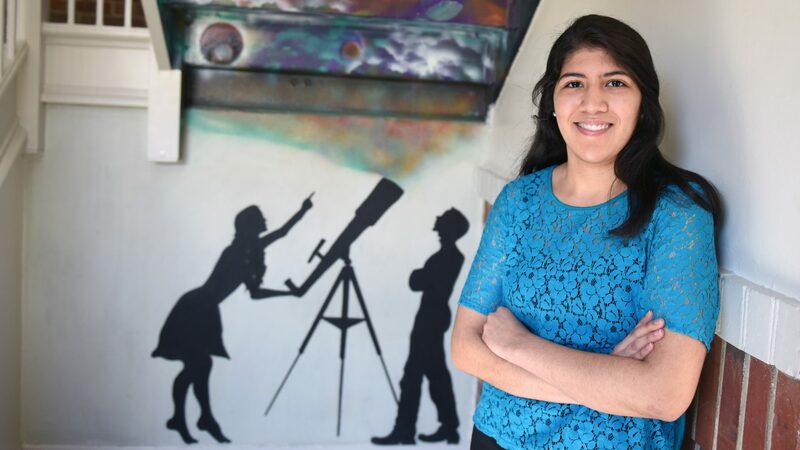 Rivera is still figuring out her future, beyond her desire to attend medical school. She knows she’d like to work in an urban setting, helping kids. Her work with the SAY Village helped point her toward that path – seeing young people who are considered “at risk” in and around Raleigh and finding ways to support and encourage them. Last summer, she shadowed in Rowan County with a Women, Infants and Children (WIC) initiative, part of a federal program providing nutritional support for low-income women and children, as well as with Salisbury Pediatrics in her hometown. The people she encountered during the summer were representative of those she hopes to serve full-time someday. Rivera said that linkage to the impact she hopes to make represents an important reason private support is essential to students at NC State, and a reason she wants to say thank you to donors.